Dr. Gail Naughton of Histogen has agreed to do a small Q&A with our community. The Q&A will be limited to approximately 10 questions. Forum members are welcome to submit your questions in this thread, in an orderly fashion. Kindly note that Dr. Naughton has NO OBLIGATION to answer each and every question submitted here. Please be respectful with your questions and stay on topic. For those who are not familiar with Histogen’s Hair Stimulating Complex (HSC) clinical trial, please read the following press release. 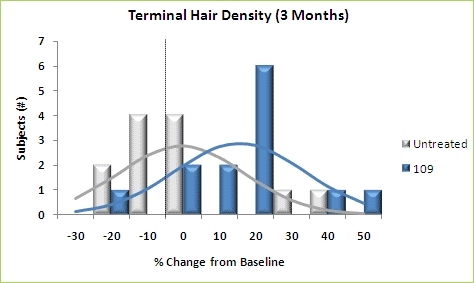 SAN DIEGO, July 27, 2009 - Histogen, Inc., a regenerative medicine company developing solutions based on the products of newborn fibroblasts grown under embryonic conditions, shared the results of the Company’s preliminary clinical trial of Histogen’s HSC human hair regrowth product for the first time at the International Society of Hair Restoration Surgeons (ISHRS) Annual Scientific Meeting. Dr. Craig Ziering, founder of Ziering Medical and principal investigator on the clinical trial, addressed attendees on July 25th, 2009 during the conference, taking place in Amsterdam July 22-26, 2009. Histogen, launched in 2007, seeks to redefine regenerative medicine by developing a series of high value products that do not contain embryonic stem cells or animal components. Through Histogen’s proprietary bioreactors that mimic the embryonic environment, newborn fibroblasts are encouraged to naturally produce the vital proteins and growth factors from which the Company has developed its rich product portfolio. Histogen has two product families - a proprietary liquid complex of embryonic-like proteins and growth factors, and a human Extracellular Matrix (ECM) material, ExCeltrix. » questions and stay on topic. If they’ll release any 5month photos. What’s the deal with their lawsuit, and it’s effect on their product release. Are they still looking for investors/ individual donations? Are they still on track for a 2015 release, or do their recent findings indicate an earlier or later release? -Is what is shown in the pics the maximum we can expect? Is it possible to get a better result if you make more injections? -Is the new hair affected by AGA? Spanish Dude has a list of questions typed up for Histogen, can you find his questions and include them? Has it grown hair in any completely bald area during the trials? Do you think we’ll have a product within 5 yrs ? This is an excellent initiative! Thank you! Also a huge thank you to Dr Naughton for taking the time to answer our questions! I would like to expand on Rev’s earlier question and ask what the 22 week data looks like? Is there an improvement over the 12 week data, was the trial maximum already reached at 12 weeks or was there even a decline in the 22 week data compared to the 12 week data? We are keeping our fingers crossed for your product! » his questions and include them? As I wrote, I already found answers to some of my questions. But if Hairsite desires, he may include them in the list for confirmation purposes. Each one of the injections have a limited scope of action. Just an area of a few centimetres wide. Perturbation seems indeed dermabrasion with a laser. And perturbation didn’t produce any benefit. So, the only question that remains unanswered is about the 22-week results. do they have this data available? I will add another question that has been already posted: does it work in totally bald areas? do they target this specific group of totally bald guys, or rather, they are focusing on thinning guys? And another one: do they target to cure women too, or just men? » Do you think we’ll have a product within 5 yrs ? I would rather don’t ask this question. It is subject to subjective guessing, and, thus, a lot of error. Better ask what do they have done so far. » This is an excellent initiative! Thank you! » the 22 week data compared to the 12 week data? » We are keeping our fingers crossed for your product! yep, the 22-week data is the main question for Dr. Naughton. » » Do you think we’ll have a product within 5 yrs ? This is a good question, hairsite please include this one. It makes a big difference whether I am going to get fue now or wait a few more years. Actually I think this is the most important question. » » » Do you think we’ll have a product within 5 yrs ? » difference whether I am going to get fue now or wait a few more years. » Actually I think this is the most important question. While I appreciate the information given by Dr. Naughton, as it stands right now this product is probably not ready to produce serious thickening of the hair. At most, it could be used in conjunction with a HT, to slightly thicken up the transplanted hair and make it look fuller. But for anyone seriously balding, say Norwood 3 and above, I don’t see that this would be any big advantage by itself. Of course, I may be wrong… but right now, judging by the pictures, it looks like something on the order of Rogaine or Propecia, maybe a little bit more potent and it takes less time to show results. That said, however – the results aren’t that amazing. But has ANYONE asked if this formula has been tested for side effects? Has it been tested for safety??? » this would be any big advantage by itself. » however – the results aren’t that amazing. IMHO, I think we should limit the discussion to productive questions to Dr Naughton if possible. » But has ANYONE asked if this formula has been tested for side effects? » Has it been tested for safety??? The press release in the original post clearly states that there were no adverse reactions (i.e. side effects) during the 22 week safety and efficacy trial. When can we expect the next clinical phase to begin or has it already begun, and more importantly, when will it end? Will the data from this trial be made public when it is available? Many people have suggested this product be released outside the US to avoid FDA regulation prior to the US launch, and in the past, Histogen has not been outright opposed to the idea; has a decision been made, or is management perhaps leaning towards one side or the other? I agree, and making claims about the products potential effectiveness is clearly premature. We have 2 sets of photos from a trial only meant to prove the safety of the treatment, which it did, and extrapolating from them is a mistake. Okay, would you think my question below is a legitimate and productive question? » » But has ANYONE asked if this formula has been tested for side effects? So I will ask this one directly to Dr. Naughton. Dr. Naughton, has this drug been tested for side effects? Is there any knowledge of it causing side effects? Is it safe? I’m not asking this because I want to denigrate the product, I am very happy about it. I just think that like any other new medication, we should know something about how it interacts with the body and what kinds of secondary effects it can cause. For instance, Propecia has some reported side effects, only in a small percentage of people, but important nonetheless. So does Rogaine and others. Also, my other question for Dr. Naughton is how does this drug work? What does it interact with in the body/cells to cause the hair to grow? what you see from the pictures are from 1 injection only!!! Many of us didn’t realize that it was done with only 1 injection. I certainly missed that when I read their report a few months ago. I would like to know if the skin product that is currently for sale has the same growth factors as the hair product. My guess is yes but obviously in a different base. I think some of you guys are kind of missing the point with the debate about asking for timelines. It’s not that some of us don’t think the question is important. I think everyone would agree that the question of timelines is damn well important. But even if they do answer these questions, some of us (including me) don’t think we could possibly get a real answer based on anything very concrete & reliable. It’s just too early in the testing for Histogen itself to know what we wanna know. So we should probably not bother adding more fuel to the speculation fires by asking for more quotes from Histogen about timelines at this stage. » about asking for timelines. » everyone would agree that the question of timelines is damn well important. » about timelines at this stage. I don’t think it hurts to ask. What’s the worst that could happen if we throw in that question? We are all speculating anyway, at least we will have something to work with if she does answer that question.